It can’t be just chance that the two best climbing films ever made were released this summer within a couple months of each other. Both featured world-beating young American climbers achieving never-been-done things on the storied rock El Capitan, in Yosemite. Together — if you want them to – the two films say something about competing paradigms in the world right now. The first film, The Dawn Wall, features two climbers, Tommy Caldwell and Kevin Jorgeson, who aim to spider up what’s long been considered an unclimbable face — a smooth, 3200-foot granite table tipped upright. With finger-shredding holds no bigger than the width of a credit card. Caldwell’s the superior climber, and at one point Jorgeson encounters a pitch he just can’t solve. He tries and fails for literally days. Eventually he decides to just give up and belay his friend to the top. But Caldwell refuses the gesture. They’re in this together — either they both make it or neither of them does. The film is a hymn to bro love, but more than that to the power of teamwork. The second movie, Free Solo, involves Alex Honnold’s attempt to conquer El Cap all by himself, via a slightly easier route but without protection. This one’s about what one ubermensch — albeit one not quite right in the head — can do alone. Unfettered by gear, or rope, or other people. With the stakes as high as stakes go. It wasn’t either filmmaker’s intention to make a political statement. But they accidentally did just that. “We’re almost talking about two rival spiritual orientations in America right now,” the journalist Anand Giridharadas said on a recent episode of the podcast On Being. “There’s a spiritual orientation that celebrates what we each do alone. And there’s a rival orientation that celebrates what we do together. These are both very strong parts of our culture. And they map onto this idea of the celebration of a heroic, capitalist, pull yourself up by your bootstraps story. “But that’s never been the only story. We’ve also always had this story of movements – it wasn’t individuals who got rid of the King of England. The most important things we’ve done in this culture have also been together. 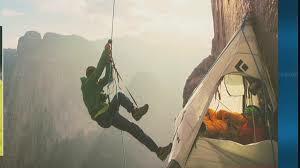 Any other year, The Dawn Wall would have been a roaring success, the water-cooler subject of every outdoor enthusiast. But Free Solo is crushing it. The story of the daredevil individual risking everything for glory is simply burying the story of the friendship and teamwork.